This light summer skirt has a multi-color all over print with an elastic waist - perfect for summer! 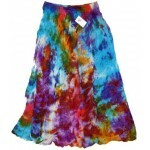 Light weight, perfect for summer festivals, this multi-color tie dye skirt comes in one size - the waist stretches from 24 to 36 inches with elastic waistband and a drawstring with belled ends. Skirt is 36 inches long from waist to hem. Very light and semi-sheer, you may want to wear a slip under it. Each is individually hand made so colors and pattern will vary. Item Number: RV-SKIRT8 | Approximate Size (Inches): 8.00 wide x 1.00 deep x 10.00 high | Approximate Shipping Weight: 1.00 lbs.